Supreme Court Vacancies: Who Will Be The Next Six? The Supreme Court collegium of five senior Judges, which met on Friday, agreed “in principle” that it would reiterate its previous recommendation – returned by the Centre for reconsideration – on appointing the chief justice of the Uttarakhand high court, Justice K.M.Joseph, as a judge of the apex court. But it has decided to do so only while recommending – presumably on May 16 – the elevation of other chief justices of high courts, who may be in the zone of consideration, for appointment as Supreme Court judges. There are currently seven vacancies in the Supreme Court, with two more vacancies likely to arise in the next two months, due to the retirement of Justices J. Chelameswar on June 22, and Justice Adarsh Kumar Goel, on July 6. But it is likely that the collegium may first consider six chief justices, in addition to K.M. Joseph, for filling the current vacancies in the apex court. Who are these six judges likely to be? The high courts which are not represented in the Supreme Court currently include Calcutta, Chhattisgarh, Gujarat, Rajasthan, Jharkhand, Jammu and Kashmir, Uttarakhand, Sikkim, Manipur and Meghalaya. Among these, the chief justice of the Calcutta high court, Jyotirmay Bhattacharya’s date of initial appointment as a judge is December 3, 2003. However, as he has taken over as the chief justice of the high court only on May 1, elevating him to the Supreme Court within a month of having taken charge may not make sense. Besides, his date of retirement as a high court judge is September 24 this year. While elevation to the Supreme Court could give him three more years of service, there is a concern that using the post of high court chief justice as a stop-gap arrangement for an appointee to the Supreme Court – without the incumbent getting an opportunity to contribute as the high court chief justice – may belittle the post of a high court chief justice, which is very important in India’s federal scheme. Judges of high courts retire at the age of 62, while judges of the Supreme Court retire at 65. Only those chief justices whose tenure in the Supreme Court is likely to be around four years are generally considered for elevation, even though there have been a few exceptions to this in the recent past. Justice K.M. Joseph’s date of retirement as high court chief justice is June 16, 2020; if appointed to the Supreme Court now, he will have a tenure of about five years – till June 16, 2023. Therefore, if the Calcutta high court indeed requires representation in the Supreme Court, the choice may fall on the chief justice of the Madras high court, Indira Banerjee, whose date of initial appointment is February 5, 2002, and whose date of retirement as a high court judge is September 23, 2019. Justice Banerjee has Calcutta as her parent high court. Besides, she has already spent more than a year as the chief justice of the Madras high court. Her appointment may also address the current gender imbalance in the apex court. The chief justice of Sikkim high court, Justice Satish Kumar Agnihotri, whose parent high court is Chhattisgarh, could be another contender for elevation. Having joined as the chief justice of the Sikkim high court on September 22, 2016, his time for elevation probably is now. His date of retirement as high court judge is June 30 this year. His date of initial appointment as high court judge is May 5, 2005. Chief justice of the Tripura high court, Ajay Rastogi, whose parent high court is Rajasthan, may be another choice. His date of initial appointment as a high court judge is September 2, 2004, and his date of retirement as high court judge is June 17, 2020. However, as he joined as chief justice of the high court on March 1 this year, he has completed only about two and a half months, which is not an ideal period to be considered for elevation to the Supreme Court. The chief justice of the Karnataka high court, Dinesh Maheshwari, whose date of initial appointment as high court judge is September 2, 2004, joined as chief justice of the high court on February 13 this year. As he would have completed just three months as chief in the present high court, it is debatable whether he could be elevated at this juncture. 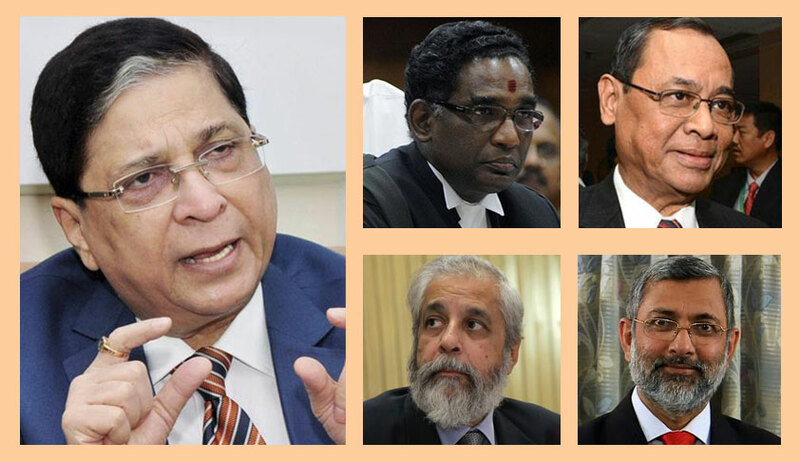 Besides, Justice Maheshwari was at the centre of controversy recently, with Justice J. Chelameswar questioning his conduct of dealing with the Centre directly, without the knowledge of the collegium, in the case of a jjudge whoseappointment to the high court had been reiterated by the collegium. Acting on the Centre’s request, Chief Justice Maheswari reopened a probe report which had exonerated the appointee of sexual harassment charges levelled by a junior colleague. If his name comes up for consideration on Wednesday, it is likely that Justice Chelameswar may oppose his elevation. There are currently no chief justices of high courts whose parent courts are Gujarat, Jharkhand, Jammu and Kashmir, Uttarakhand, Sikkim, Manipur and Meghalaya – the other high courts which have no representation in the Supreme Court at present. Obviously, if the collegium wants their representation, it has to consider the names of eligible judges in these high courts who are not currently chief justices. But Friday’s resolution makes it clear that Wednesday’s discussion would focus on the high court chief justices who could be elevated along with Chief Justice K.M. Joseph. Chief Justice K.M. Joseph is the longest serving chief justice of a high court at present, having been appointed on July 31, 2014. But in terms of his initial date of appointment as high court judge, which is indicative of all-India seniority, he ranks 16th among the 24 high court chief justices. With Justice Chelameswar retiring on June 22, the collegium may also consider elevating a chief justice with the high court of Telangana and Andhra Pradesh as parent high court. The chief justice of the Gujarat high court, R. Subhash Reddy, whose initial date of appointment was December 2, 2002, and who is retiring as a high court judge on January 4 next year, is a strong contender to fill Justice Chelameswar’s slot. The other contender to fill the vacancy to be created by Justice Chelameswar’s retirement is Justice Ramesh Ranganathan, chief justice of Telangana and Andhra Pradesh high court. His date of appointment as high court judge is May 26, 2005, and therefore, the collegium may consider that he could wait for his turn, unless, of course, the collegium declares him to be a judge of outstanding merit. The chief justice of the Madhya Pradesh high court, Hemant Gupta, whose parent high court is Punjab and Haryana, could be another contender for the slot to be vacated by Justice Adarsh Kumar Goel, whose parent high court is also Punjab and Haryana. With July 2, 2002 as his date of initial appointment, Justice Gupta has been chief justice of the Madhya Pradesh high court since since March 18, 2017. He will have more than four years’ tenure in the Supreme Court, if appointed now. Justice Pradeep Nandrajog, chief justice of Rajasthan high court, whose parent high court is Delhi, may also be considered for elevation. His initial date of appointment as a high court judge is December 20, 2002, and he has been the chief justice of Rajasthan high court since April 2 last year. Justice Nandrajog could be considered for the slot to be vacated by the senior judge of the Supreme Court, Justice Madan B. Lokur, whose parent high court is Delhi, and who retires in December this year. However, if seniority is to be given emphasis, the chief justice of Gauhati high court, Ajit Singh, whose date of initial appointment is April 1, 2002, may be considered for elevation, as his parent high court is Madhya Pradesh. A factor which may work against him, however, is the fact that Madhya Pradesh is already represented by two judges in the Supreme Court at present, Justices Arun Mishra and Abhay Manohar Sapre. Among these names, Justice Indira Banerjee, Justice Subhash Reddy, Justice Ajit Singh, Justice Nandrajog, Justice Maheshwari, Justice Rastogi and Justice Hemant Gupta rank senior to Justice K.M. Joseph in terms of all-India seniority, as per the date of initial appointment as a high court judge. The question the collegium will have to consider is whether to place Justice K.M. Joseph’s name ahead of the other names, so as to confer him the seniority it had clearly envisaged for him – and which he has already lost to Justice Indu Malhotra, because of the Centre’s improper segregation of names in the order, recommended by the collegium in January. If the collegium does so, will it give rise to a fresh controversy, as the other chief justices of the high courts being recommended for appointment as judges of the Supreme Court – but who would claim seniority over Justice K.M. Joseph in the all-India list – may feel slighted?